Apply to the face to set foundation after application. Tip! Apply with a powder puff using a rapid patting motion, not a wiping motion. 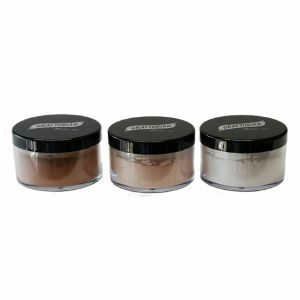 This pressing of the powder into the make-up dries all residual moisture and leaves a dry matte surface that is smudge free to touch. Brush away any excess powder. 3 colour options available. Skin tone and Translucent also available in the larger 5oz size.